The strings (threads)used in shamisen are called ito, and are extremely elastic twisted silk (sometimes Tsugaru and other use the nylon and The tetron for 2nd ito and 3rd ito, those are not threads). 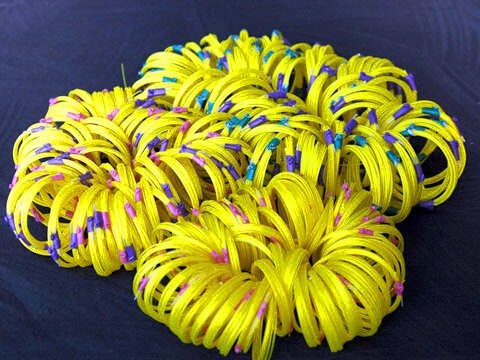 It seems as though the third string is not plied, but each strand is only twisted very thinly in one direction, and glue is applied to the surface. The first and second strings are four-ply and twisted more thickly. In order from the top when the shamisen is held in playing position, the first string is the thickest and they get thinner in order. And also the first is called ‘ithino-ito’, the second is called ‘nino-ito’, and the third is called ‘sanno-ito’. These are differentiated numerically; for example, a 15-1 relate to a thickness of 15 and the top string (number 1). When you order, if you just try to order a Number 1 string, it will not work, so you have to order something like this: a Fuji thread (brand name), nylon (material), Number 15-1. The second string would then be a Number 15-2, and the third a 15-3. The thickness depends on the style of shamisen and to some extent on the player’s preference. Approximate classifications are set out below, but as this is not a definitive standard, please just use it as a reference. The main brands include the following. Fuji Thread: seems to be often chosen among beginners and for practice. It is also the cheapest. Marusan Kotobuki-Thread: Master of the Shamisen (Lecturer) is the most used among performers. There are Standard and Premium grades. Most performers use Premium. Among the premium grades, Joruri Thread is the best. Medium thickness threads weigh in at about numbers 24 and 25, while thicker threads are at 27 or 28. Hatsune Thread: The same as Kotobuki Thread, this is a thread used a lot by people who have graduated from Fuji Thread (intermediate level). It has Red and Gold grades, and Gold is the most used. Generally, Tsugaru Shamisen players use Fuji and Marusan Threads, while the Minyo stylists use Hatsune. Silk: The best level threads are silk. However, silk is said to ‘catch a cold’, which is if it stored unused for any length of time it is susceptible to moisture and prone to deterioration and breakage, and this will also lead to a deterioration in the quality of sound. Purchasing large amounts is not recommended. Tetron Polyester: synthetic fibre close to silk. It is several times more long-lasting but as it is so hard it causes wear and tear on the wooden parts and the pick faster. Nylon: Softer than Tetron. It makes a strong thread that can be used for any of the three threads in the Tsugaru Shamisen. And in this respect any thread is the same, but when your pick comes close to damaging your thread, you can try restringing it the opposite way, or otherwise adjusting the thread until the worn bare sweet spot is in a different position. If you try something like that you may be able to extend the life of your threads a little. And just to introduce one little titbit of information, why are the threads yellow despite being silk? This is because they are coloured with turmeric for its insect repellent properties. So all Ito’s color is only yellow. It’s an unusually little-known fact.